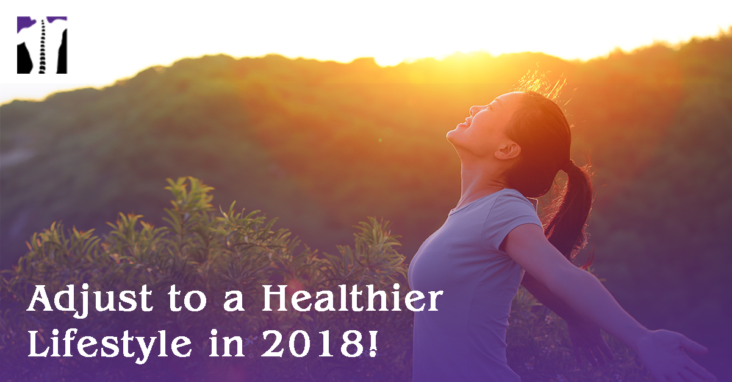 Adjust to a Healthier Lifestyle in 2018! Jan 02 Comments Off on Adjust to a Healthier Lifestyle in 2018! With 2018 approaching, it’s time to start thinking about how you can improve your overall health and well-being. Ault Chiropractic encourages you to start the year off right by committing to a healthier lifestyle. Making strides to your health now will make a positive impact on the year ahead and help prevent painful injuries in 2018. Here are some tips to keep in mind. We teach our patients special “blueprint” exercises designed just for them to help strengthen and correct their own unique problem. These exercises can be performed in the comfort of your own home and can improve the effectiveness of your spinal correction. In addition to skeletal misalignment, muscles and connective tissues can be out of place or strained by improper alignment and use. Specific exercises and stretches can help your body stay in balance and in health. Not only will proper exercising decrease your risk of obesity and diabetes, it can also help reduce back pain and other neuromusculoskeletal symptoms. Increasing the amount of moderate activity such as brisk walking, riding a bike, or general gardening by less than 20 minutes a day can reduce back pain. We often find it helpful to “coach” our patients on certain activities they should avoid or do differently to avoid aggravating their health challenge. Our goal is to help every patient achieve a fulfilling and happy lifestyle full of the activities they enjoy most. We recognize that each our patient is a whole person, and help them reach true health and wellness is a collaborate effort between our professionals and our patients. We provide specific recommendations on nutritional supplements and healthy food choices to enhance our patient´s return to optimal health. We can provide a structured nutritional program based on your individual needs. Hydrating is also key to keeping your body happy and healthy. Stick to water, natural juices, and other decaffeinated beverages. Every day, more than 1,000 people are treated in the ER for misusing prescription opioids. From 2000 to 2015 more than half a million people died from drug overdoses. Nine Ohioans die every day from an opioid overdose according to Ohio Atty General Mike DeWine. Beyond the risks of addiction and overdose, prescription drugs that numb pain may convince a patient that a musculoskeletal condition is less severe than it is or that it has healed. This misunderstanding can lead to overexertion and a delay in the healing process…or even permanent injury. A non-invasive, non-drug treatment like chiropractic’s approach to pain management is an important first line of defense against pain and addiction caused by the overuse of prescription opioid pain medications. The stress from poor posture can lead to back pain by causing problems with your muscles, discs, and joints. While walking, it’s important to look straight ahead of you and to keep your head balanced straight above your spine. Avoid dropping your shoulders. When sitting, keep your arms flexed at a 75 to 90-degree angle at the elbows. If you lift something heavy, bend your knees and keep your back straight. This way, your leg muscles will do most of the work. Maintenance is Key to Healthy Living. Just like continuing an exercise program and eating well to sustain the benefits of exercise and proper diet, it is necessary to continue chiropractic care to ensure the health of your musculoskeletal system. Research has shown that routine chiropractic adjustments help maintain proper biomechanics of the spine, reduces the stress hormone cortisol and boosts the presence of infection-fighting antibodies in the body. When you make routine chiropractic care a part of your lifestyle, you avoid many of the aches and pains that so many people suffer through. Also, your joints will last longer, and you will be able to engage in more of the activities you love. Implementing a well-balanced diet and lifestyle will help make 2018 the best year yet! For more guidance, contact us today.